We make a screen top for every tank we set-up at BRS! Clear netting lets about 99% of light through unlike glass or acrylic all the while keeping your beloved fish and critters in. 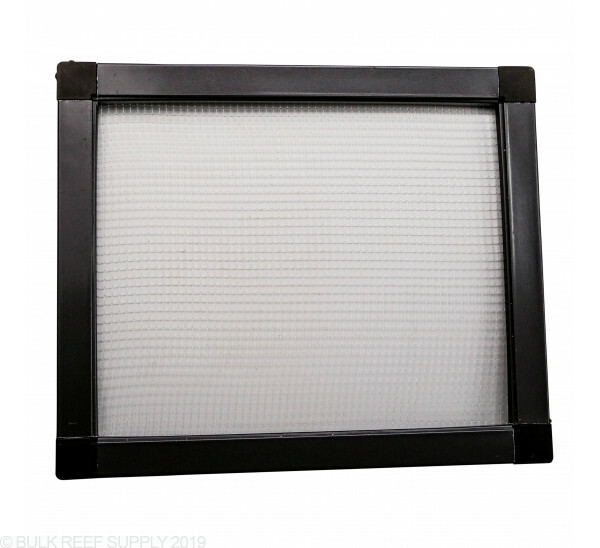 Build a screen top for your aquarium on your own with one of our DIY Kits. We now offer kits for traditional rimmed aquariums. Rimmed kits come with more corners and frame to complete a screen top kit for a rimmed tank. A traditional aquarium will come with a plastic trim to reinforce the glass on the top and bottom rim. Smaller tanks under 3 feet and under traditionally do not have any center braces even if there is trim on the tank which keeps things pretty simple which selecting a screen top. Longer tanks like 4-foot to 6-foot tanks the trim will divide the tank up into sections with the bracing where rimless tanks will not have any bracing. 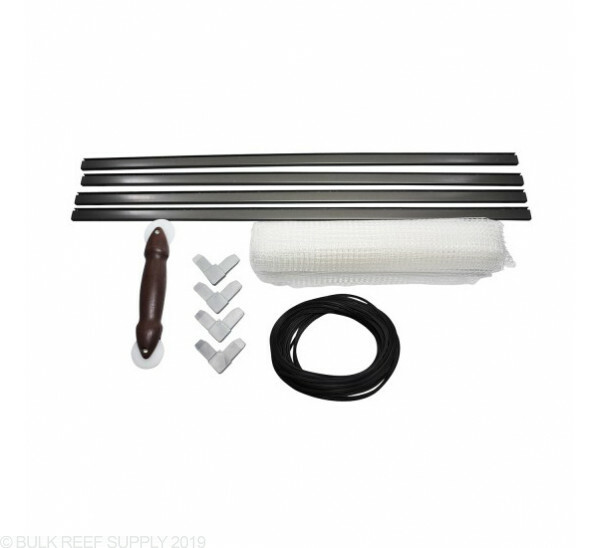 If you have a rimless tank 4 feet or over without any center braces you will want to get a Screen Top Net Kit for Rimless tanks of the appropriate length. If your aquarium has trim with bracing dividing the tank up into multiple sections you will want to get a kit for Rimmed tanks which will include more screen frame corners and frame than a rimless kit would. Rimmed kits come with more shorter sections o the screen frame, and corners that traditional aquariums with trim and bracing will require. Rimmed kits will allow you to make multiple screen netting tops if your tank requires multiple. 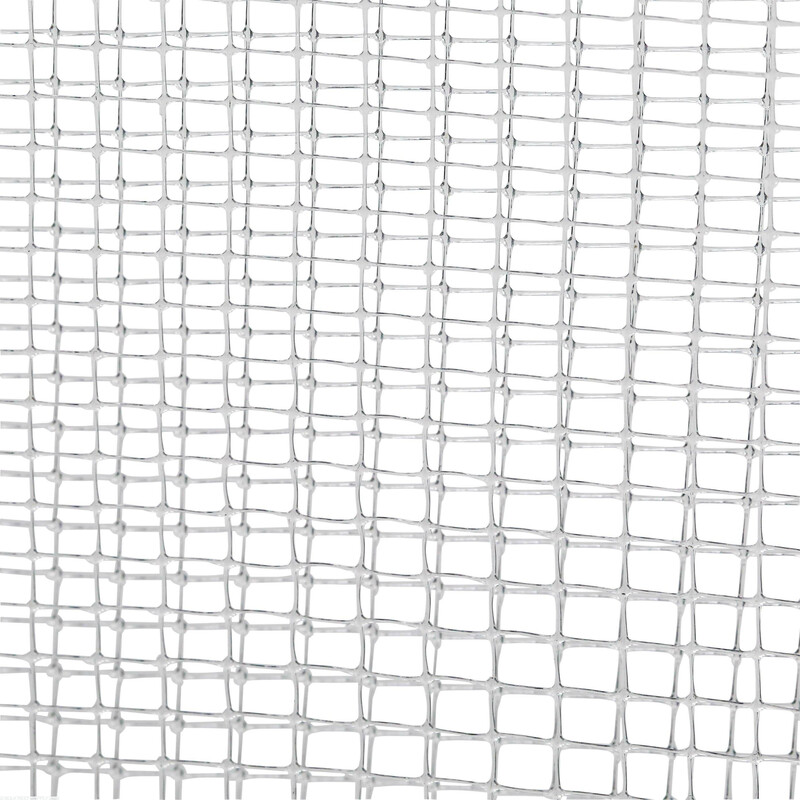 Each kit includes frame sections, screen corners, roll of 1/4" netting, spline roller and spline. 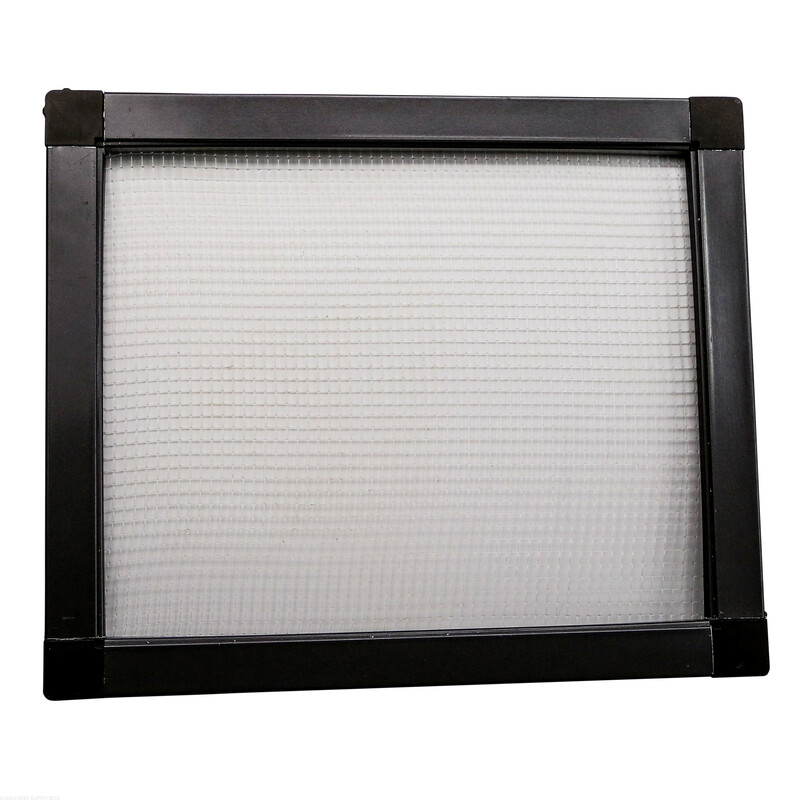 Screen frame can easily be cut with a typical hacksaw or saw with a metal blade. This is not a bad kit if all you need is a basic square. Aluminum framing is basic and pretty flimsy but it works for a basic square. If you need to make cutouts in the square, do not bother with this. If you put any tension on the netting the aluminum frame will bend and will not stay the right shape. I purchased the 3'x2' 1/4" kit and 4 extra corners to make a cover for my 3'x2' tank and a cutout for the radion rms mount. Everything worked great right until I put in the netting. The 2' side that had the cutout in the middle immediately bowed and there is no way to fix this. When I contacted BRS they said this is a common issue and there is really no fix. Recommended the red sea kit and that's what I'll be trying next. Would never recommend. Way over priced , I didn’t know you could get this stuff at the hardware store for way less. Also turned out to not work at all the spline will not stay in the track and now I’m left with 40$ worth of trash. If you are not looking for a headache make sure not to purchase this product. I got tired of cleaning the glass top panels (3 of them) on my 72" 180G tank and saw this on the BRS site. One of the better purchases I have made. My PAR values went up by 15 units and my PH by 0.1. I like that I can just pour food in and I'm not hitting my lights when I open and close the top. I was not super happy that the kit I ordered did not contain the netting. I called BRS and they shipped me the missing net...via two day. The net they shipped had some sort of black stain on a portion but, there was more than enough in the package so I didn't have to use the black part. QA/QC seem to be a little lacking IMO. I also wish there were more corner pieces - you will be making squares or rectangles nothing complicated. If you have plumbing or cords coming out of your tank you will need to leave a gap the length of the panel or find some extra corner pieces. I found assembly to be a two person job - there is no way you can pull the net tight and push the spline in at the same time. I tried to tape the net down on the floor but, it didn't hold for me. I also found that pulling the net too tight caused the frame to go out of square, that was a minor eye sore and it doesn't negatively affect function. Very over priced for what it was. After watching the instruction video (DO THIS) I ended up with a pretty good looking screen top in one try. I highly recommend that you pick up a metal file to finish your hacksawed edges since they will NOT be clean. Also, a metal file allows you to shave an extra mm or two if your cut isn't perfect like mine. I received enough spline and mesh netting to do this four times over (24"kit), so the extra was nice. Using the clips on your rimless tank? FACTOR IN the inner tank width those clips take away when measuring. I had to painstakingly shave two of my frame pieces down for a proper fit. Also, 1/4" netting is plenty small to keep jumpers out (I don't know what another reviewer was talking about). Maybe the smallest neon goby could make it through if it had a perfectly vertical trajectory, but nothing in my tank is making it through this netting. I have a 5'x2'x2' 150 gallon that I am setting up and purchased the 6' rimmed tank kit. Watched the quick how to video on youtube and it expalined everything perfectly. From start to finish it took me about an hour to complete all 3 sections by myself and it turned out perfect. Highly recommend. This kit is poorly designed and constructed. The metal frame is very flimsy and the paint was scratched all over when I received it. There was no instructions in the kit. Also you can only make a square frame, the corner pieces do not work if you try to make a notch around your light fixtures or cabling, etc. The rubber material that is supposed to hold the screen pops out all the time. And when I tried to put some tension on the net to take out the slack it bows the frame. I wasted $45.00 as it all ended up in the trash. Fish can jump through this 1/4 netting. Are you not aware of this BRS? A quick internet search will show you how common this is. Something should be said about this in the description. I lost a firefish and a juvenile clownfish. The fish couldn't have gone in a worse way than being trapped on top of the net under the light looking down at the water. Something meant to keep fish safe and in the tank, did the exact opposite. The product itself is a great idea. It comes with everything you need to make your screen top (you WILL need to buy the clips seperate fyi) . It does exactly what it is supposed to do and you should be able to build your screen in about 10min unless you have to alter it for fit. That brings me to my only real complaints. I ordered the 24x24 top kit but it is actually 25.5" x 25.5" so it requires precise cuts on each side to make it fit. Not a big deal to most but for some that could be an issue. I gave it 4 instead of 5 stars based solely on value. The product is extremely overpriced IMO. Nothing you do will make this top look like a $40 top! But it gets the job done and you always receive great support/service from BRS making it your best option. For a 40 breeder tank (36 x 18 x 17inch), which kit should I buy? thanks!! The 3ft kit should be the perfect option for you and can be cut down to just the right size. I have a Kessel AP700 and the mounting arms hang over the frame of the aquarium. Can I still use a screen top on this tank? How would that work? Thanks for the question! When using mounting arms you may have to cut the screen top just short enough to clear the bracket that clamps onto the tank. Usually that distance is pretty small, and some people will even modify the screen corners to have their top go physically around the mounting arms too. My tank is 72" X 28", how wide is the netting that you sell, i don't see any problem with the length. My tank is rimmed and has a center brace, so i will be making 2 screen sections. Just trying to get as much info as possible , hoping to get everything i need in one purchase. 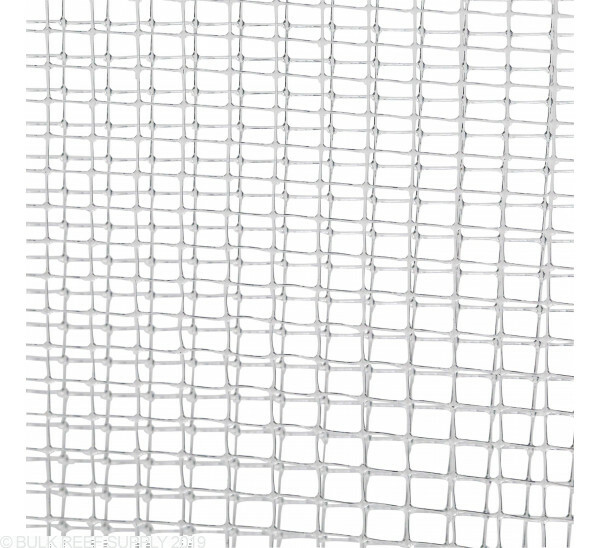 The actual piece of screen netting we include with the 6' kit is a 6.5-foot square piece of netting. that will most likely leave you with quite a bit extra. I have a 30x30 rimless cube which size would you get? Thank you for reaching out to Bulk Reef Supply! For your tank size I would recommend the 4' option. On a rimless tank you will also want to look into screen top suspension clips for the screen to rest on. There are different sizes for thickness of glass so be sure to take into account how thick your glass is when ordering. I hope this was helpful. Please reach back out if you have any further questions! I have a 36 x 18 tank with a brace down the middle. Should I get the 5ft version and trim it down to two 1.5’ cubes? Thank you for reaching out with your question. I apologize for the delay in getting back to you. The screen kit for rimmed tanks come with enough corners to make 2 screens so you would want the 3 foot kit for rimmed tanks.